We are looking at the lower part of the small capstan: the lower part of the barrel with its spindle. The step of the capstan, which would normally be fixed between and underneath two deckbeams, and that would contain the hole for the spindle to fit in, is no longer present on the model. Maybe it was never there in the first place; I can't tell. I think, the hull of the Gent model is now pretty complete covered with your photos for me and all interested modelbuilders. One thing remains. Do you have a view of the Galion from above? I really would like to see the grating deck. I have already noticed that the so-called broekstuk is missing. As you may have noticed, I am not that interested in photos of the rigging, as most of it is later reconstruction. I think, Witsen, Winter and "Der geöffnete Seehafen" will do. As i inderstand, the broekstuk is a part in the lower transom. How and were did you notice it missing in the gent model? 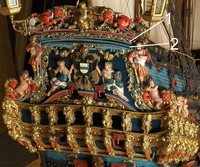 Broekstuk also refers to the curved closing piece of the two upper rails of the galion just below the volute of the "Es" on the back of the lion. It´s missing in GM. I think I found that word in Van Yk (his galion description). Bye, Rein. Jan, Rein is right about his 'broekstuk' in the beak. Van Yk describes this 'broekstuk' on page 106: "Van 't Broekstuk. Om het Broekstuk, dat tot Sluiting vande bovenste Regelingen, voor in 't Galjoen geplaatst werd, ...". I guess you placed a 'broekstuk' in your Corel Prins Willem as well, because Ketting shows it in his book (German version, page 77, drawing 7, Konstruktion des Galions, 1. Brookstueck). Try not to look at the latrines: these are made and positioned by mister Birnie. Yeah, the lower part of the gammoning near the stem is wound underneath or in an opening in the gammoning knee in front of the stem. I don't think this was common practice. Probably the gammoning near the stem is a later add on. 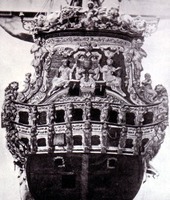 The Hohenzollern-model only shows one and most of the ships, if not all, of the Amsterdam Admiralty from this era only show one. Here's another something to satisfy your baroque needs. This should get you through the weekend. Are these carvings original, or did someone add to those somewhere at some time in history? The carvings must be original. As Rein explained: they look 100% authentic. And, the pictures of the model before it was restored by Birnie, show these same carvings too; they were painted in black and white and some gold details though. Birnie painted the whole model, including the carvings. Here's another example of the exquisite carving on the model. Enjoy! Could you show the old picture of the gM you are referring to? Here´s such an older black and white picture, (about 1925) unfortunately the only one in my possession. The lijst is painted black here, but also looks still out of place for me. Note the different appearance of the coat-of-arms. The lanterns are missing, too, but fortunately today are back again, except the one in the middle. Really don´t know, if it was ever there. Unfortunately, the picture was cut at the bottom, so that we cannot see the full shape of the "spiegel". Bye, Rein.